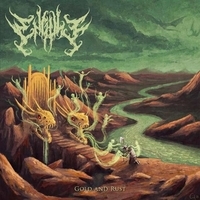 ENGULF is a one-man Death Metal project, which is a bit unusual for this style of music. Not that it is unprecedented, I can think of at least one Death Metal band where one person plays all the instruments and does vocals (RIPPED TO SHREDS), but it is definitely no mean feat if what you are recording is not some kind of Depressive Suicidal Black Metal where songs have two riffs and vocals are just manic screeching. The drums are actually programmed, but I could barely notice it. “Gold and Rust” is only the second EP that Hal Microutsicos has put out under the name ENGULF (following “Subsumed Atrocities” that came out last year), but boy does it slap. The first impression from this three track EP was that it is a very good SUFFOCATION rip-off, but after multiple listens the picture became more nuanced. SUFFOCATIONS are, of course, the pioneers of Brutal/Technical Death Metal, so obviously their influence is going to be heard in bands that go for this more new school sound – bands on the Unique Leader Records roster etc. SUFFOCATION also started the whole sci-fi/horror theme into modern Death Metal and ENGULF doesn’t stray from the beaten path when it comes to lyrics. The maniacal SUFFO riffing and vocal style constitute the basis of the songwriting, but there you will find nice touches that give ENGULF its own character: dissonant layers that give the songs a thick atmosphere, or some more contemporary elements like the Slam-y breakdown at the end of the first track “Maul”. The same goes for the closing song “Sovereign to the Seven Underworlds”: it has breakdowns but also an almost freakish atmosphere. If you’re down for something extra heavy, brutal and technical, this would be an excellent choice. After listening to this 12 minute EP you will only find yourself wanting more. It is not particularly original, but the riffs are pulverizing and the execution is excellent – you really can’t go wrong with this.